Who's ready for a more leisurely pace than that of April? I am. I think of April like Germany's Autobahn. Full speed ahead, look out! Blogger in the fast lane, get OUT OF MY WAY! This trip, however, is a meandering journey through the list of participants, at your own pace, with your own rules, and very few expectations. Heather, Nicole and I (Tina) invite you to join us! Tips for the road: you're in charge. Want to visit one new blog a day? 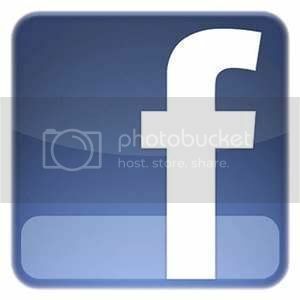 Want to visit hundreds of blogs a day? No problem. You're driving. Unless you hitch a ride with a friend, which I think is a good idea. You might want to take turns driving, or playing the tunes. It's really just some friends hanging out and continuing visiting. Whatever you do, don't forget that this trip is a journey, not a destination. Signing up on the linky doesn't mean you're committing to visiting ALL the blogs. All you're saying is, “I ain't done yet.” We'll have some encouraging rah rah posts along the way, and a chance for you to share your best “finds” along the road. Personally, I like those little Mom and Pop cafes that are off the beaten road, and the food is real and so is the atmosphere – so those cool but unknown blogs that need some customers! Plus Heather G. too, for a gnomy ol’ time. 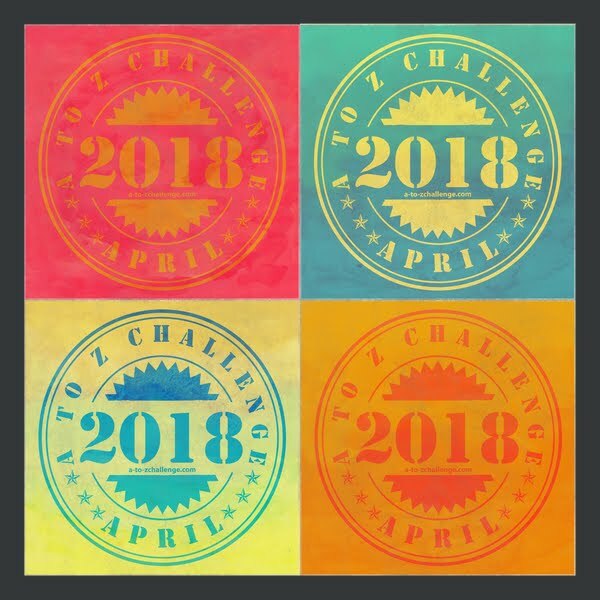 We’d like to see all of you on our Post-Challenge tracks. The blogging skies couldn’t be any clearer. So step on your gas pedal and don’t look back. Until we tell you to pull over at our rest stops when they’re in sight! 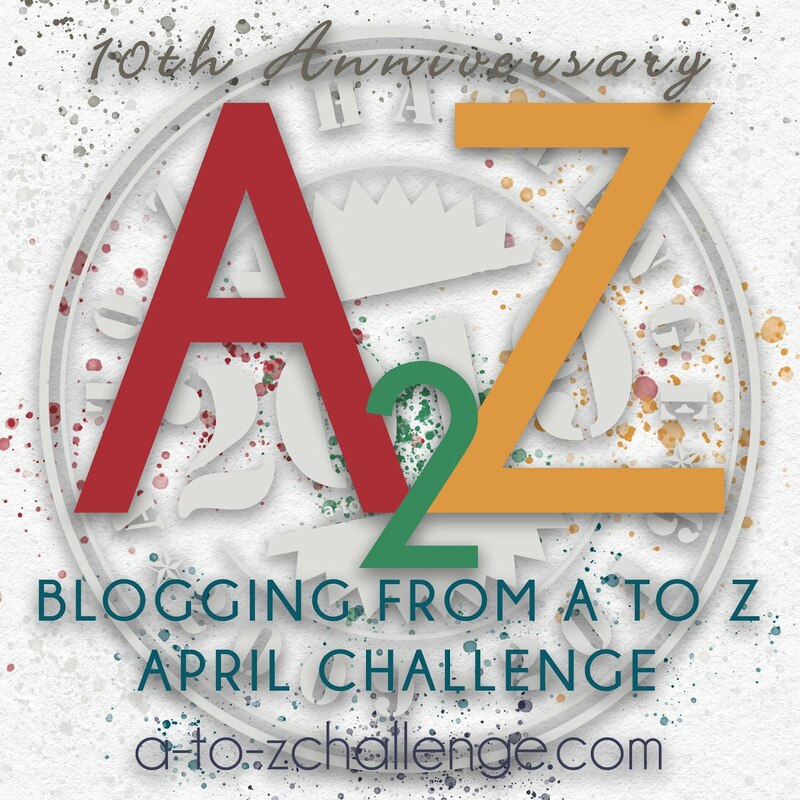 Beep your horns if you’re hitting the road with us to visit those 2014 A-to-Z Challenge blogs that we missed in April! My playlist for this year’s road trip is topped off with “Speed Demon” by Michael Jackson and “Cruz” by Christina Aguilera as a reminder that we can get our alphabet highway mileage in at whatever pace meets our driving preferences -- and the capacity of our gas tanks. Roll down your windows, folks, it's gonna be a beautiful day! There's an empty highway on the horizon and I can't wait to see where it's heading! I know I missed a TON of amazing blogs during this year's Challenge. We had over 2000 participants, of course I missed some, but now is an opportunity to hit the road and discover all the the blogs still out there, waiting to be found. I'm in the back seat with Stormy the Weather Gnome. I've got two experienced drivers up front, Tina & Nicole, and they can't wait to get started. For the Road Trip, Stormy and I are going to try to hit at least 20 blogs a week and tell you about a few of them in each of my posts. That's the plan anyway, so put on some sunglasses, turn up the radio, set the cruise control, and let's get on the road! I'm in! I didn't visit nearly as many blogs during the challenge as I wanted to. I'm hoping to hit the rest during the summer - perfect time for a road trip! Anyway! Welcome! It's going to be a great summer. We tried, oh did we try, to remove dead links and non-participants and commercial links from that loooong list, but you will find some that didn't participate. Think of that like hitting a pothole or a speed bump, or a chance for a rest-stop, take a deep breath, and then get back on the road. Or, call for the pit crew. Personally, I'll be equipped with my extensive and eclectic iTunes library, this magical blue tooth speaker cube that hooks to my iPhone, a cooler of fancy meats and cheeses, Diet Mtn. Dew, the beverage of champions, and then for pulling over at night - chardonnay! I know it's a favorite of Nicole's as well. Heather, what's your night-time beverage? Although I had gotten to a fair number of them, I have already been continuing through, so might as well continue the journey with others. Since I didn't get to visit many during the Challenge, I'll join you. I've gotten to lots of the blogs but obviously not all so there's always some distance to be covered, especially with company! :) Will the original list stay up by the way or will it disappear after a while? I like the pace. For once, time is on my side. Let's do this! THIS linky will be open through the end of the summer, for people to join us, but THE LIST will remain "live" and visitable until the Challenge of 2015 starts. Good question! Keep 'em coming! Welcome keithchanning, musicfanadrea, Finley Jane, Alex, the Ninja Captain himself!, melaniegobledvn, and kaygetscrafty! Hello there. This was my first challenge and although I'm totally exhausted, nothing like a trip to recharge those energy cells, so count me in! So far, I've visited about a hundred blogs after my original signup link, so I think, I'll just continue on at the same leisurely pace all the way to the end. Please wave when you see me stroll past, even offer me a beverage or two...non-alcoholic of course. ;-) See you along the way! I am in, and I am going to drive very, very slowly. Maybe, one new blog a week? Oh yea...I already indicating I would be continuing to post a-z in May, so definitely in. I've continued to visit folks on the original linky in groups of 5...just picking up where I left off, and had planned to incorporate the reflections linky as well...so grabbing the badge and pealing out! Rob was amazing as one of my Ambassadors. He may not always have left a comment, but he did visit every blog that had a good link and regularly filled me in whenever he found a bad link or a blog that needed to be looked at. Thank you Rob! Great Road Trip post! I love how you presented this. Like so many others there were many blogs I never got around to and this will be a good opportunity to catch up on those. Thank you ladies for the great blog tour ahead of us! Art have fun....blog from 2009? Egads the one listed under it, Kuzuk, even older! The Challenge that never ends. Good grief! Reflection pawsts, road trips and before you know it, it's April Fool's Day, 2015! HELP!!!!!! Of course, I mustn't forget Nicole, Heather and good old Stormy! You folks are such a fun bunch. And Rob is very supportive with little attention paid to his site. Hopefully, Rob gets more visitors. April was awful for me getting about and checking out other participant's blogs. I hope to check out a few a week henceforth! I'm in! I'll bring some snacks. Hope you like chocolate! If we come across a "pothole" of a blog, do we report it? If so, to who? I am the contact person. Alex is running the linky for us, bless his busy Ninjaness. Please report bad links to tndowney at gmail. Good question! Welcome TheCyborgMom, Kevyn, Penny, Patricia, AJ, Sandy, Entrepreneurial Goddess, Romi C.
Arlee, thanks for your kind words of encouragement! Sorry I am a bit late arriving, I have been at an important all day meeting for work. The life of an eccentric child in cyberspace can get rather serious and busy in the real world at times as well as add a number of creaky bones and a faulty brain. I did visit all the blogs I could during the A to Z and by that I mean all the ones that had a good link. some did not, one or two folk never got going and one or two had rather complex ways of getting to their posts. Anyway I really appreciate being mentioned and I would never have been able to visit every blog and comment also, but I felt by visiting, it helped to improve the list overall. 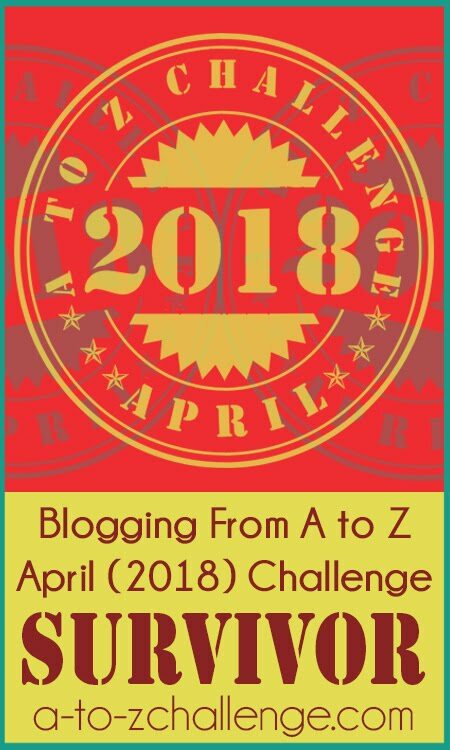 Sure there are blogs that have not finished the A to Z but I think everyone on it now had a go and after all it is not a competition so finishing is unimportant meeting other like minded bloggers is what it is all about. At the end of the day supporting each other in some form is to the benefit of the blogging community, so I would like to think I did my little bit to help the A to Z.. . . . . . But I can run away again now and be grumpy until next year. . . . . . Good luck with the road trip one and all. I love a good road trip! Seeing new sights, wandering down country lanes and checking out the little towns. The best part about a road trip is the people you meet along the way! Thanks Tina! And thanks to Alex for running the linky. You guys are like the Energizer Blogging Bunnies!! Full of good ideas. Easy to commit to this one since it was my intention to continue visiting bloggers on the list. I think it is a terrific idea to start with the ones who wrote reflection posts. And I like that we are in charge - so I can pace my visits - summer will be less computer time as golf, biking and gardening beckon. Also I can decide if I want to visit one of their A to Z posts or a more current one. My dopey human is sleeping, Mr. R. I left the comment on Tina's gosh darn lovable blog :) Gary is a virtual recluse who knows you aint grumpy. In fact, you mean well and now we want to show the world you mean well. My name's Penny, also :) You can only do what you can do. As for me, none of this month long stuff. 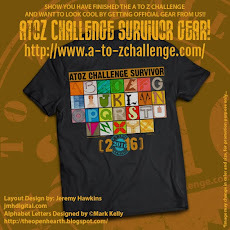 No way, I did my alternative challenge, loved and adored by the trillions of A to Z folks. Thanks for chiming in and for reinforcing what we're all about. Winning is connections with others!!!! But I LIKE thrift shops...That sounds like a really nice comment. Besides, Arlee calls his minions "ambassadors" so it totally fits! Thanks Tina, Nicole and Heather, for organizing this-- this will give me the opportunity to visit all those blogs I missed out! And Mad props to Rob-- that was quite a feat!! This sounds like just the road trip I was planning. Much more fun to do it with friends. Love your posts above. I feel the wind blowing through my hair. Looking forward to the ride. Maria, "http://delightdirectedliving.blogspot.com/"
I am in for the road trip this year. 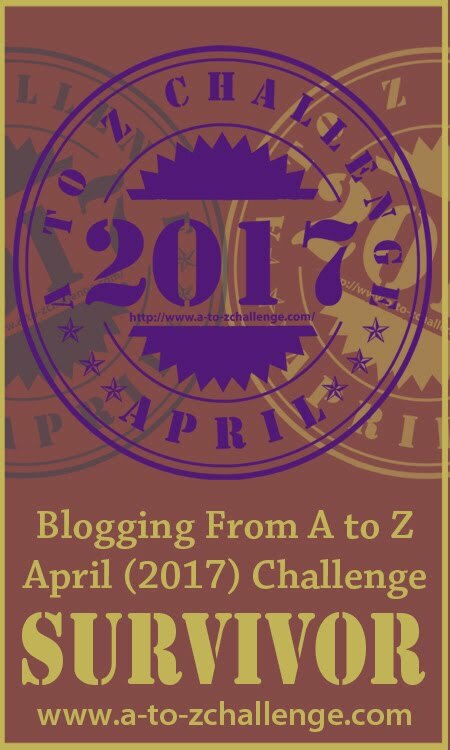 As I am still slowly posting my own A to Z posts I was too busy to visit very many other blogs this year. Looking forward to getting a chance to do it now. Being abroad for April made it super hard to keep track and find time to visit blogs :( so cant wait to find all the awesome places I missed! Amazing! You are wonderful people that want to join us on this crazy trip!!! I'm in! I didn't get to network as much as I would've liked during the challenge. The Reflections post does have its own separate sign-up which is now closed. You can use that list to start your Road Trip since it's smaller--though starting with the Road Trip list would also be a good place to start. Over the upcoming months you can continue with the master A to Z list which can be found in the tab at the top of this page.. What an epic journey! Great idea! I hope a lot of the bloggers I didn't get to visit, sign up. Thanks for the reminder. I've now added a page that's listed in the top tabs. first A to Z back in 2010. I'm in! I usually stick with following/reading 3-4. But I plan on visiting everyone's blog! I totally forgot to come back here like the Survey e-mail said. Maybe someone is like me and just now looking at this post, so I'll add mine! Welp, and I can't. lol I'll still browse around the others! Debra, this is last year's Road Trip sign up. Go to the 2015 Road Trip post and you can sign up there.